Since its official release back in August of 2016, Never Go Back has reaped positive reviews from Celtic music fans. I for one, finds The Great Silkie a fascinating song. It’s a wise choice for the band to make it an opening track because it warms you up to the style of other songs. It makes you curious and excited. Powered by the beautiful voice of Fae Wiedenhoeft, this album of fourteen tracks succeeds in its intention of inspiring diverse listeners. The band’s musical style is fresh, friendly and also easy. What I mean when I say ‘easy’ is that it transcends the genre. Whither you are into Bluegrass, Jazz, Rock or Folk music, this album certainly has something for everyone. The percussive element of Never Go Back is also what drives listeners to stick around. It never gets boring or draggy. Seastar have a rich sound palette because of their love and mastery of many instruments. Experimenting with scales is also one of the album's many strengths- as evident in their official single Never Go Back- as well as other songs that project their expertise in World Music. Now, I checked out the bio of all members and I noticed each has his own history. For example, Ron Allen not only sings and plays the guitars but he is also the owner of Four Lumen Studio in Kirkland, Washington. Captain (born Adam Shea Chambers) plays the bass and he is also a film maker, poet, and novelist. Michael Falcone, aside from being a synth wiz, vocalist and percussionist; is also a filmmaker, voice-over artist and film location scout. Fae(who is the captivating voice of the band) is also an award-winning songwriter and a member of the Grammy Association. If there is this element that connects the band , then it has to be their love for visual arts. And it all makes sense. If you listen to Never Go Back, you can get that sense of being transported to different places and time with each song. They love adding texture and attitude to each of the instruments used in various songs. And at times I think the instruments are voicing their own story behind the story of the song-writer. I think Never Go Back deserves an award of sorts for bringing people to the simplistic, down-to earth aspect of Celtic music. It is an album that can feel at home in the trendy but intimate atmosphere of coffee shops or the green sunny warmth of outdoors. And I can certainly ride my bike to these songs. They are so alive, so one with the earth, wind, fire and water. Celtic folk from an American band who live in Seattle, just about as far from the Celtic heartland as it is possible to get! If that is not enough, not only do they play their own interpretation of old Celtic music but they write most of their own songs in that style as naturally as if they were born and bred in Britain. We know that plenty of Britons play country music as naturally as if they are Americans so I suppose it should be no surprise when Americans reciprocate, but it still is, at least a little. As is the case with the best of the British artists who play country music, their own influences and backgrounds are brought to bear on their music that whilst rooted in folk also includes echoes of country, bluegrass and even 'old timey' music. Of the fourteen songs that clock in at just on an hour nine were written by Fae, one is traditional, one is credited to Francis Fahy and trad., one by Stan Rogers, one by Robert Burns and Melody Benbow and the evocative Along the Tay which was written by Michael Falcone who also provided the excellent lead vocal. The album opens with a gentle mandolin and guitar intro on The great silkie with a little percussion and Fae's beautiful vocal on a simmering, moody traditional song that includes some nice evocative harmonies. Fae's Never go back is a haunting tale with banjo, throbbing bass, guitar and Fae's vocal with male harmonies on a just below mid tempo composition that has a strong country feel but of an indeterminate age! If it'd rain clocks in at seven and a half minutes and shows what can be done with a sparse instrumentation if the song and vocals are strong enough. The banjo introduces us to this epic tale with piano and occasional bass assisting Fae's gorgeous vocal which exhibits a depth of drama that makes further instrumentation superfluous, with the metronomic banjo throughout being quite mesmerizing. On Stan Rogers Giant the melodic electric guitar has a sound that helps create an almost medieval atmosphere with Fae's lead vocal echoing that evocation that is deepened by the addition of what sounds like a bodhran giving support to the bass. The final track on the album is an incredibly haunting song with the male harmonies, when added to Fae's lead, intensifying the powerful sense of drama whilst the throbbing bass and lovely dobro sound create a deep dark atmosphere. This is not a band that is trying to copy British traditional music but a group of musicians who have a natural flair, love and feel for the music, whilst stirring in their own influences and modern ideas without having their vision blinkered. The album is steeped in old traditional music but conversely is also highly original and has a strong contemporary feel, making me want to further explore their work along with more of Fae's solo albums. The best of all possible worlds! Fatea Magazine features news, reviews, live events, interviews, gossip from in and around the acoustic scene. the best of new and established bands. Sea Star's a Seattle-based four-piece band centred around the songwriting of singer and multi-instrumentalist Fay Wiedenhoft. The majority of her compositions are story-driven songs in the contemporary folk mode, these tending to be thoughtful but also embracing an entertaining element, as on the driving maritime-themed Little Blue Boat. The album - Sea Star's third release - also takes occasional departures into the realms of Celtic and rootsy-bluegrass-flavoured Americana. The disc opens with a take on the traditional sea-ballad of The Great Selkie, and later embraces the neo-traditional Galway Bay (written by Francis Fahy) and Robert Burns' Highland Mary, all efficiently done, alongside a gutsy electric-folk rendition of Stan Rogers' Giant that would do Trees proud. The latter cover aside, though, the most persuasive tracks tend to be those where rootsy Americana is to the fore and the scoring's centred around Fay's banjo and a sparser acoustic backdrop - the title song and If It'd Rain being the highlights for me, along with the brief, yearning a cappella number Austin. There's more to enjoy during the course of the album, especially during its second half, and Fay's strong singing voice and confident delivery imparts the whole album with a certain measure of unity. Even so, it can all seem just a little too effortless at times, for all that Sea Start's music is suitably accessible and radio-friendly without being bland, and with accomplished instrumental contributions using electric, acoustic and slide guitars, mandolin, accordion, piano, bass and percussion. Sea Star's is an admirable mission, to maintain a variety of moods and styles while drawing the listener in with their stories, and by and large it's a case of mission accomplished with Never Go Back. From Ricky Kej, Grammy Award Winning, Indo-American composer, music producer and conservationist. Such a pleasure listening to this album! 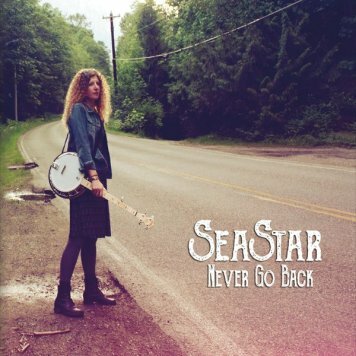 On 'Never Go Back', the successor of 'Northwinds' Seastar on its chosen path of Americana with very big influences from Celtic and folk music in a beautiful way on. SeaStar offers on this new album next quality as well quantity. No less than 14 songs with on exception 'Austin' after all so take time and close to four minutes. Beautiful songs also in this traditional, yet very interesting album of this formation which enjoys far too little known in the Netherlands. Striking is the strong vocals of Fae Wieden Hoef who is also responsible for the majority of the songs. Beautiful songs that stabbing above the beautiful opening "The Great Silkie" falls a bit later 'The Great Western' on. "If I'd Rain," "Giant," "Little Blue Boat ', all excellent songs. What stands out is the beautiful instrument use. Captain Chambers, Michael Falcone, Ron Allen filling the game of Wieden Hoef as she plays banjo, mandolin or bodhram. The band has had a significant turnover and bijvoorbeel in the Netherlands also well-known and highly regarded violinist Geli Weurzner was part of SeaStar in the past. In many songs nautical themes and if you choose the Celtic tradition is understandable. 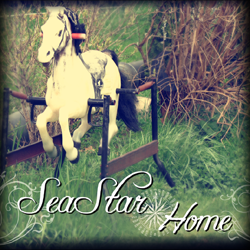 Seastar with this album sometimes traditional, sometimes daring wanted nice mix of Celtic folk and Americana. The result is to be proud of. Been following this band for a while, and have seen a few lineup changes. Somewhere I have a CD of this album (Home), but I'm no good at keeping things organized, so I got the download. I love old time country and folk music, and I have at times doubted whether writing songs in that style is possible, or even a good idea. SeaStar blows those doubts away, and tears down the wall between our era and others and makes original songs that might be really old songs, except you know they aren't if you have seen them live and heard the intro identifying the song as a Fae Wiedenhoeft original. Do yourself a favor and see this band! I bought the CD (of course) and was fortunate to grab a quick conversation with her after the gig. I learned that she had other music available online through bandcamp.com and CD baby. I also found a few YouTube posts. She also plays with a group called SeaStar and teaches voice and a variety of Celtic instruments. February 26, 2015 - CelticMusicRadio.com - With a velvet voice, a hearty laugh, & the traditions of the Celtic winds, Fae Wiedenhoeft takes her listeners on a musical journey through history & tradition. Fae is an award winning songwriter. Her traditional sounding compositions and heart breaking songs are loved and revered by many across the globe. She has traveled across the US, Canada, Ireland, Turkey, and most recently Scotland where she played in Dougie MacLean's Perthshire Amber Festival (2013) and the 2014 Celtic Connections Music Fest. Her Castle Walls album is a collection of 12 songs with a timeless and melodic Celtic Folk flavor performed by Fae Wiedenhoeft. The talented Chicago songstress has been performing since she can remember, and she eventually developed a certain confidence in her vocal skills that would allow her to craft beautiful harmonies and truly drive the songs with heartfelt dynamic swings. Songs like "The Wild" or "Vidalia", feature a relatively straightforward instrumental backbone, with the classic folky rhythm stomp setting the mood. Fae is able to take that familiar format and turn it into a personal and original expression. "West Coast Morning" is probably our absolute favorite track on the recording. The acoustic guitar arpeggios bring the melody from bright to dark and back, adapting to the depth and richness of Fae's vocal range. We love the "bare" feeling of this track, as it relies on two sole elements, yet feels incredibly accomplished and full. The second half of the album departs a bit from the Celtic footprint, embracing elements of Americana and blues: songs such as “Parksville” and “Melody” are great examples. With “Castle Walls”, Fae Wiedenhoeft set out to represent many different musical expressions, translating them into a broadly appealing format and earns a 5 star review from Celtic Radio! The Celtic Music Radio Album of the Week commencing Saturday 8 February is from Fae Wiedenhoeft’s SeaStar who visited the Celtic Music Radio base at Adelaide’s, Glasgow during Celtic Connections 2014. Fae Wiedenhoeft talked to Ross Macfadyen about her music, new album and her visits to Scotland. With a velvet voice, a hearty laugh and the traditions of the Celtic winds, Fae takes her listeners on a musical journey through history and tradition. She performs independently and with her bands SeaStar and Syren throughout the Pacific Northwest. Compared and influenced by the greats of Joan Baez, Joni Mitchell and Sandy Denn, Fae’s song stories are a must for fans of Celtic folk. Fae is a folky, Irishy, curly haired girl from Seattle, WA, USA, who likes to sing about love, birds and remembrances kept in a favourite hiding place. Fae finds secrets in sea glass and stories in driftwood. Her music sounds like dancing flowers, wind through trees, and the raspberry sky at sunset. She loves to hear people’s tales and dip her toes into waters unknown. Fae also performs with her long time singing companion, Melody Benbow, in their band called Syren. The ladies have been together since 1998 and continue to entertained international audiences. Album of the Week, Saturday 8 February 2014 at 12 noon and 12 midnight and Monday 10 February at 6.00pm. "I've just finished listening to your CD "Hope." Not since I listened for the first time to the songs of Kate Wolf or Mary Black has a CD given me so much pleasure. It doesn't pay to try to explain why you like a song or any work of art. When you listen to a song that hits the target it is like a watch where the time reads only "Now" on its face. Nevertheless, I'll try to explain why your music gives me pleasure. First of all, your music is not escapist. Life is full of joy, loss, happiness, grieving, blues and ragtime. As my old history professor John Wolf used to say: "history is just one damn thing after another. And honesty requires that we look at the whole picture." When I listened to your "North" I was reminded of Mary Black's "Song for Ireland." And your treatment of love in your songs reminds me of Kate Wolf's melancholy appreciation of the joy and fragileness of our relations with each other. Please, understand I am not saying you are good because you sound like Kate and Mary. You are good because your understanding is on equal to theirs. And BTW you play the guitar well. Thank you so much." "...born of Celtic and folk roots..." Sea Star consists of Fae Wiedenhoeft on vocals and guitar; Captain Chambers on bass; Geli Wuerzner on fiddle and vocals; and Michael Falcone on percussion, keys and vocals. 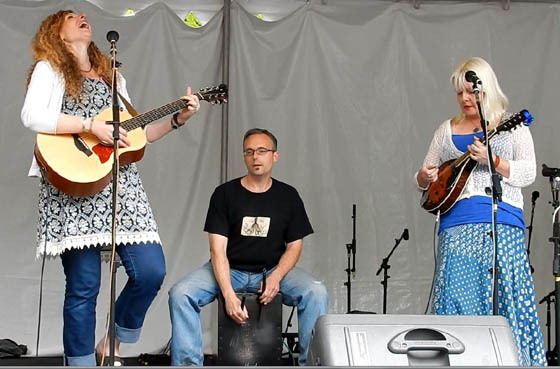 This quartet from Bothell is now releasing their CD recorded in the tiny town of Index, Washington. All songs were written by Fae except for 'Dark Eyes', which is a traditional Russian tune with lyrics from Melody Benbow from Vancouver Island. I can't explain why 'Dark Eyes' conjures Marlene Dietrich, but it does. Perhaps it is the integral violin that makes these compositions seem right out of a gypsy camp. A formula of steady rhythm guitar, punctuating drums and bass, hypnotic violin and Fae Wiedenhoeft's voice makes for a pleasant mix. These are mostly love songs and Fae opts to choose the best vocal line. Her voice is lovely and she can often do without words. The words, available at SeaStar's Facebook page are quite interesting. Her vibrato is warm and captivating and these are nicely crafted tunes. 'True' has a mesmerizing guitar rhythm with counter melody notes plucked on the violin -- love songs with modern lyrics, but with an old feel. 'Broken' has the lyric "...if I surrender control, I can be free..." 'Sparrow' is a lovely song, with space for the keyboard, bass and violin. This is probably the best presentation of Fae's voice. "Who stole your wings little sparrow, little one. Who keeps you in the trees, far from your dreams?.... for the world is cold and the one you love's far from thee." 'Friday Smiles' sews together images of a current relationship, "we caught a boat beyond the blue, blue bridge and the seasons changed..." 'Moon Jubilee' contains, "... our very breath joins hands with the fog..." Fae works at her lyrics though they sometimes don't stand as tall above the mix of instruments. 'Drawn & Quartered' is instrumental and has interplay of the plucked violin and tapping of the hand drums. 'Lilac' begins with violin, pauses, and then Fae sings. This is probably the best track, "...and I saw reflections of summer trees and you, bicycle rides, laughter...we created new worlds out of clouds dressed as clowns." 'Home' is the title track and certainly has determination, "I'm not willing to say goodbye for this is my home." Overall, this is nice music, beautiful violin stuff, rhythm, bass, lyrics and singing. Sea Star is chock full of originality, and it will be fun to see where this goes.
. My newest entry in the “Yuletide World Music” section will also be given some well-deserved spins this month. 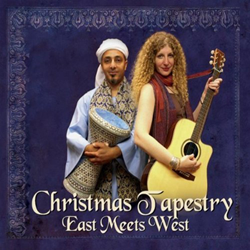 Christmas Tapestry: East Meets West is an album that you probably won’t hear in the malls or during a 48-hour Christmas music marathon on the radio. And that’s perfectly fine; this is an album best enjoyed in front of a warm fireplace. The album is a creative collaboration between two artists hailing from the Pacific Northwest: George Sadak and Fae Wiedenhoeft. A native Egyptian, Sadak is a master of the drums and the dumbek, an Egyptian form of the tabla. Since coming to the U.S., Sadak had the opportunity to use the ancient musicians to a vast array of musical genres. When he is not performing in concert, Sadak operates the Barking Dog Studios in Edmonds, Washington, the facility in which Christmas Tapestry was recorded. An exceptionally strong vocalist, Wiedenhoeft arrived in Victoria, British Columbia upon completion of a theater arts degree at Roosevelt University in Chicago. She first gained recognition for her inspired singing with a Celtic group, Kitangus. Like Sadak, she is into musical multi-tasking; when not on stage, Wiedenhoeft operates her own music program. For this disc, Sadak and Wiedenhoeft gathered the finest musicians from the Pacific Northwest’s Middle Eastern music scene. Maurice Rouman is featured on the oud, an instrument Western audiences will recognize as being similar to a lute. David McGrath plays a flute indigenous to the region called a nay (or ney). The violinists are Alimah Helming and Joel Gamble, Dan Sales plays the guitar, and John Sanders is featured on the accordion. Generally, the songs on the CD veer toward the spiritual. “We Three Kings,” “God Rest Ye Merry Gentlemen,” “Silent Night,” “What Child Is This,” and “Oh Holy Night” all sound like they are from the repertoire of a good street group entertaining the pilgrims along the crowded cobblestone steps of Jerusalem (perhaps they are). Long associated with the 1958 version by the Harry Simeone Chorale, “Little Drummer Boy” becomes the “Little Tabla Boy” in the capable hands of Sadak. Two other nice departures from the usual arrangements are “Coventry Carol” and “Good King Wenceslas.” The most authentic composition on the CD is a Coptic hymm called “Eporro.” Coptic traditions and culture come from the Egyptian Christian faith, and this hymn features a splendid vocal from Samia Panni.
."The voice... I thought I was listening to an angel..."
"Your voice reminds me so much of a younger Judy Collins. Like a feather trapped on gentle wind. Beautiful." "Your guitar and your voice have my soul soaring like a condor in the open sky..."
"Fae is the breath of dancing leaves in Spring. She is the voice of unending song riding atop galloping clouds. Her history travels through the Midwest, into Canada, the Pacific Northwest and lands where she lives without ever setting foot on their soil. She chases laughter like breath and she is a hungry soul who listens for the timeless tales of the people she meets. Fae is a friend and lover to all things musical, and she has become a messenger of song and dance. Fae is stardust, falling around you, in the woods at night. Her music is the sound she makes as she falls gently, and mystically to Earth..."